This is called Confrontation by a photographer named dsb_nola. You can find him/her at Flickr.com. Now they compete style-wise. 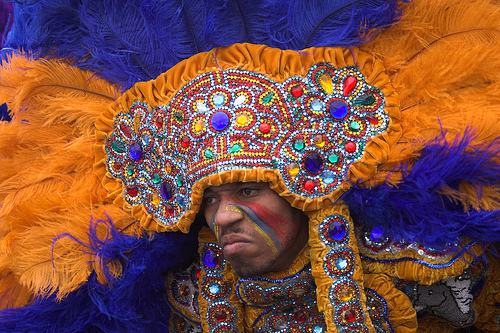 These are black men who were proud of their mixed heritage (Indian and black; black and Creole), of their artistry in making these beautiful feathered outfits, and of being men who made a life for themselves and for their families. I was always amazed that they were men who didn’t care that they were sewing, a mostly female art. I knew there was a certain class of black men who were tailors, but these men were not always tailors. They were men who did heavy work with their hands: longshoremen, construction workers, truckers. They spent months, putting together these costumes, often at great expense and personal sacrifice. Yet every year, they were a wonder, blooming at Mardi Gras or on St. Joseph’s Day. They are always a great wonder, even after Katrina. Well done, bro. Hope you don’t mind, but you do look rather fierce there. Can you tell me to which tribe do you belong?